Coach Kerry MacDonald brought something new to the UBC men's volleyball team: a winning formula. In 2016, a new men’s volleyball head coach stepped onto the court at War Memorial Gym for the first time in 13 years. It was his first head coaching role in a Canadian university. He was young. He was an academic. Two years later, his team were national champions. Though the Thunderbirds had a core of Canada’s top talents — including Irvan Brar, Byron Keturakis, Fynn McCarthy and Mat Guidi — coach Kerry MacDonald brought something to the UBC makeup that only his PhD in injury prevention could provide: a winning formula. Its components? Statistical analysis of Canada West’s ever-changing benchmarks, serving analysis and in-depth injury prevention techniques. Beyond the numbers, MacDonald’s strategy is building a stronger game. Though a volleyball player throughout his teens, MacDonald switched to coaching when he moved to Calgary for his undergraduate degree. His coaching resume during his years of academia includes an assistant coaching role with the Calgary Dinos volleyball team as well as roles with the national teams’ full-time training centre and the youth national team program. Having completed his undergraduate degree, he went back to do his master's in coaching and worked as a coach with Volleyball Canada. In that role, he fortuitously coached the son of Dr. Willem Meeuwisse, the University of Calgary’s Sport Injury Prevention Research Centre director and current NHL medical director. Meeuwisse eventually became MacDonald’s PhD supervisor. MacDonald brought that injury prevention expertise to UBC where he advocated for a new way of thinking about volleyball: by the numbers, the stats and the probabilities. With the help of James Brotherhood, former director of sports science and sports medicine at UBC, MacDonald found a team to help with data collection and hired a data collector to begin noting the minute details of each men’s volleyball athlete, well beyond what boxscores are able to provide. 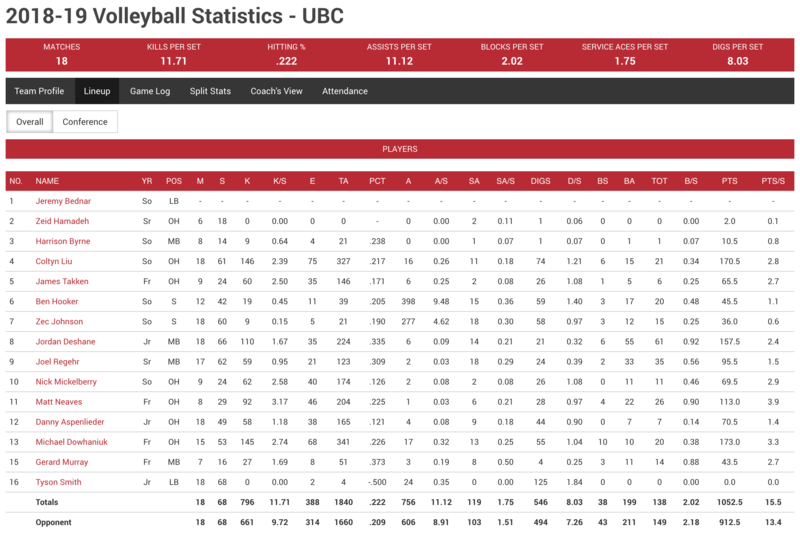 In Canada West — UBC’s regional league within national university sport — volleyball teams are generally limited to what is available within the boxscore when it comes to data. That includes stats like aces, services errors, kills — the bare bones of the sport. The Thunderbirds are not one of them. MacDonald’s staff notes every particularity of UBC’s game. His team also tracked data from other Canada West team throughout their seasons, allowing the Thunderbirds to numerically analyze how they needed to play against each school to win. In terms of the data’s analysis, MacDonald did that work himself. With Canada West teams winning 30 of the last 32 national championships, MacDonald believed that tracking data only across the Western teams would give them a good chance of winning nationals in the 2017/18 season. That mentality paid off. 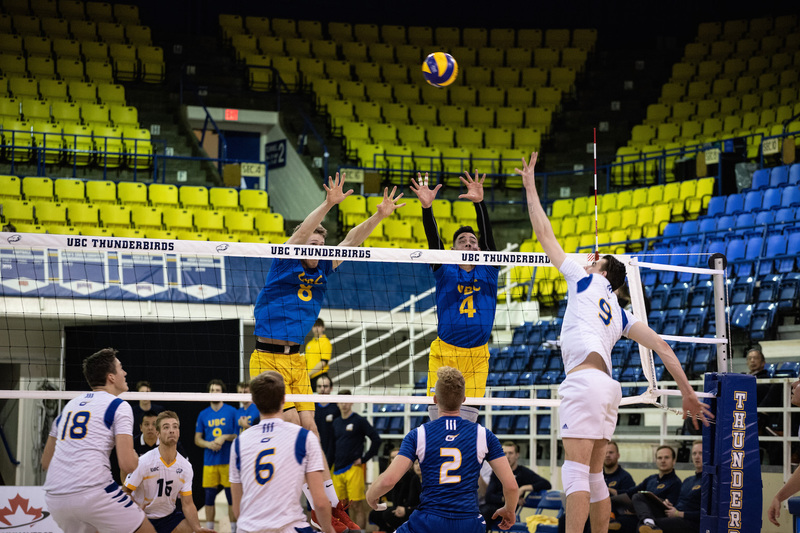 UBC won the national title for the first time in 35 years on March 19, 2018, defeating Canada West rivals and two-time reigning national champions the Trinity Western Spartans in three sets. The data goes beyond the comparative. With thousands of data points accumulated throughout the season, MacDonald is also able to peg individual athletes’ key performance indicators and better their game as a unit. For UBC in the 2017/18 season, that strength was in serves. From what is available in the standard Canada West boxscore, you can only see the serves that result in a direct point or a direct error, but nothing in between like serves that started a rally, for example. For MacDonald and his team, they believed that that wasn’t enough. “On the high end, that’s probably [only] 30 per cent of all serves in a game. What we started doing was diving more into the 70 per cent and understanding the nuances within the 70 per cent,” MacDonald explained. With that system, MacDonald was able to determine optimal velocities for each of his players — data that could then be translated into individual athlete profiles. Through his first season as head coach, those profiles were developed and by the 2017/18 season, they were being used to hone the ‘perfect’ serve for each Thunderbird. 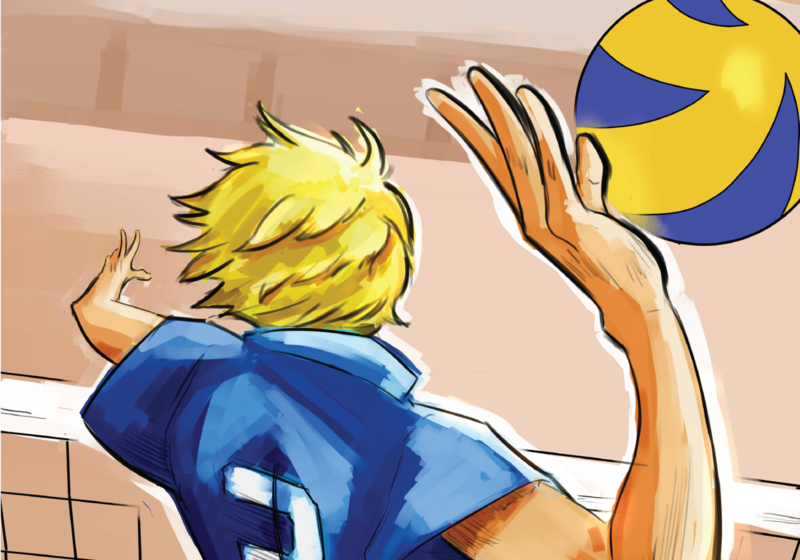 It was unlike anything done in volleyball previously. “Traditionally in volleyball ... players kind of go back to the line and they hit a serve and it’s almost a different sort of serve every single time; they serve to a different player, they serve a little bit harder, little softer depending on the time of the match or whatever else,” MacDonald said. By the end of their 2017/18 championship season, MacDonald’s team led U Sports with 215 service aces, 51 more than their next closest competitor. They had set the record in Canada West in aces per set with 2.34 and starting setter Keturakis had set the U Sports individual aces records with 65. “It kind of became what we are known for ... just being a really, really hard serving team. And I think a lot of people would say it’s why we won a national championship,” MacDonald said. 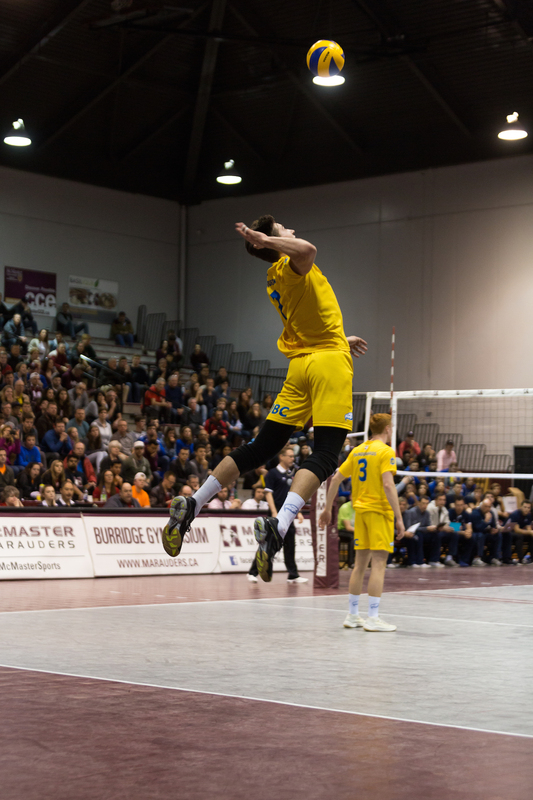 With the U Sports volleyball season beginning in October, ending — if playoffs are in the cards — in March and consisting of back-to-back games scheduled almost every weekend during those months, staying healthy is a key concern for teams. For MacDonald, finding the balance around each athlete’s training regime was something that worked into his area of expertise. He just had to add in one component: accelerometers. 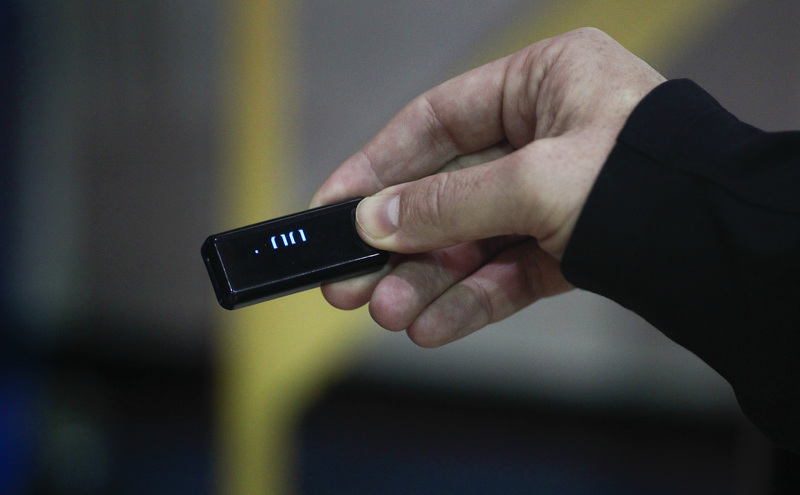 A small, USB-like device that slips into a waistband, accelerometers are worn by each player on the roster in practices and in games. The device monitors the weight and impact on athlete’s joints from jumping— a key movement in volleyball and something that can cause overuse injuries — as well as how much they’ve jumped in a session. With the information MacDonald receives from those devices, his staff can do load monitoring for each athlete to keep them game-ready. That data can also help evaluate each athlete’s prime work rate leading into games, be that how many jumps they do in a practice or what their weight room training looks like. “Throughout the week, [athletes] may get a bit more time off or we may not train them as hard because we see … they jumped a lot on a Friday and Saturday weekend playing,” MacDonald said. As current team captain Joel Regehr explained, the data is added to their reported pain scores before and after practices and games. “If you’re really thinking about it, it kind of helps you get a better grip on how your body is feeling and how you prepared for practice as well … [MacDonald] can track where it is on the graph throughout the week, the month and the whole season. It can allow guys just to be more … mindful of how their bodies are feeling,” Regehr said. That injury prevention work by MacDonald’s team made sure the players were in top form for the national championship last year. Graduated team captain Irvan Brar, who now plays professional volleyball in Germany, also saw the individual benefits of MacDonald’s load monitoring work throughout the team’s roster last year. “With this type of environment for student athletes, where sleep might be sacrificed for educational attainments, our team was feeling fresh and energized heading into our post-season versus feeling drained and worn down,” he said in a statement to The Ubyssey. Though risk came with reward in the 2017/18 season, the Thunderbirds experienced their own hiccups on the run-up to their national title. That year, the team had the most service errors in Canada and lost some statistically winnable games while testing out certain serves — two small blips on an otherwise spotless resume. Balancing those odds and taking the risk are not unlike MacDonald’s own path to the team. As a soon-to-be PhD candidate in injury prevention at the University of Calgary, MacDonald saw the posting for the UBC head coaching role and applied. A university coaching position had always been at the front of his mind and he only had two schools in mind: Calgary and UBC. “I thought the odds of either of those positions becoming available were next to none. And so when the UBC position did get posted, I kind of threw a hail Mary … thinking there’s no chance they’re going to hire a young coach [who’s] really just some scientist for the position,” MacDonald said. Even so, he threw his name in, knowing that he would only accept the position if he was able to come and do research simultaneously, creating a living laboratory with the team. “Little did I know that that would be really well-received by UBC and that’s really a push and initiative of our department is to be cutting edge on the science side,” MacDonald said. In 2014, UBC invested in sport science and innovation within Athletics. The support allowed the department to improve on mental performance, nutrition, strength and conditioning, and athlete care like physiotherapy. “Kerry’s resume didn’t have the experience that we would typically be looking for a head coach, but he did have an incredible education. 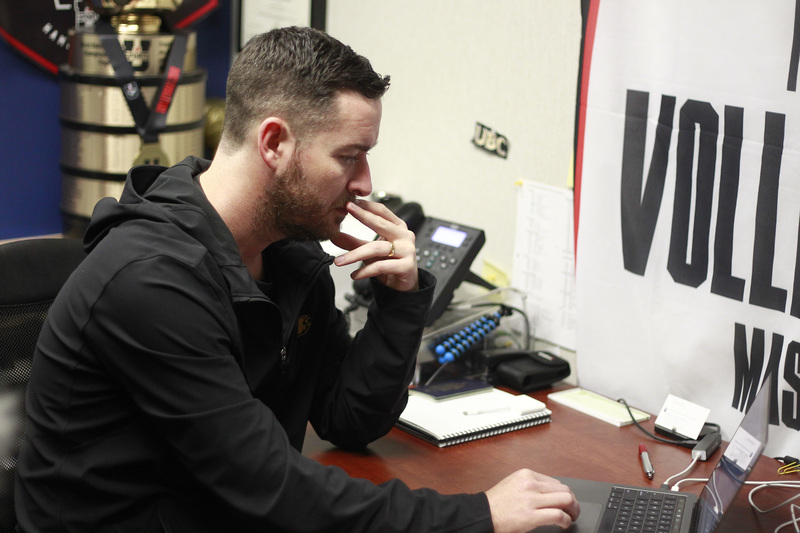 And so it [peaked] our interest ... We thought the potential would pay off, not just for volleyball but potentially for the department in terms of helping to shift more people towards that innovation mindset,” UBC Athletics’ Director of Performance and Team Support Gord Hopper said. Now, three years since accepting the role, he has a national championship in hand and a role with Volleyball Canada as the director of sports science and innovation — a new position created in the sport’s national governing body. He also earned a Coach of the Year nomination from Sport BC. The winner will be announced in March. Kerry MacDonald on his award nomination for Sport BC Coach of the Year. Though he is no longer the head coach at UBC, he has stayed on in an assistant coaching role, sharing an office with long-time friend: former UBC Okanagan coach and current UBC head coach Mike Hawkins. “I like to tell people every day is kind of a new adventure and I don’t really know necessarily where things are going to go,” MacDonald said. With most of their star players from last season now playing pro, Hawkins and MacDonald are testing out the data on a younger core of athletes. The team had a tough first semester, going 2-10 through their first two months of games. That said, MacDonald is still optimistic about the years to come for the Thunderbirds. And the Thunderbirds have that wealth of data knowledge and their cutting-edge techniques to continue to elevate their game, both as individuals and as a team. For department staff, MacDonald’s strategies for training and injury prevention are an exemplary case for their use of sport science among teams going forward. “Kerry is an instrumental part of [their case] because he was the leader and has the background and was striving for that and we were as a department supporting it, all those cogs started to move together and we’re greased really well, so it’s just a really good example of how when it does work, what can be done in Athletics,” Senior Manager of Sports Science and Sports Medicine Samantha Ebata said. MacDonald’s ideas are even beginning to trickle down to other Thunderbird teams. Women’s volleyball is beginning to implement some of MacDonald’s ideas around injury prevention and load monitoring, while the women’s hockey team is interested in the analytics. “What Kerry’s done is really demonstrated a stronger connection between science and implementation — and when you see it implemented and it works then all of a sudden, you start to pay more attention to it. So I think what we’re seeing, like some of the load monitoring work that he’s doing, I think that that is contagious in a really positive way,” Hopper said. For Brar, the work MacDonald did with the team has continued to impact his professional career with German side Düren SWD Powervolleys. “The work Kerry implemented with us has carried beyond just that of winning the championship but has also translated into my first pro-season overseas in Germany,” Brar said. Going forward, Brar hopes MacDonald can help his professional team implement similar load-monitoring technology into their training. 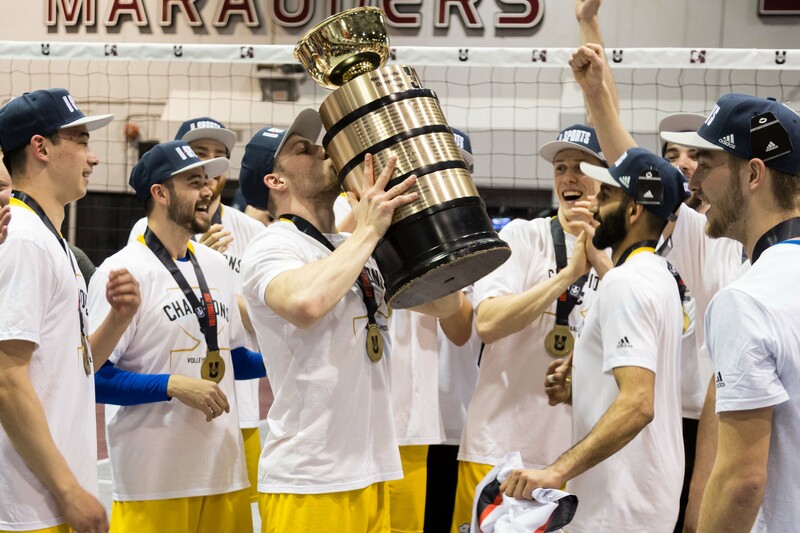 Within the UBC Athletics department, Hopper sees that direct correlation between MacDonald’s sport science work and their national title, particularly when considering the low injury rates within the roster and the serve data. But perhaps what resonates is the mentality the sports scientist brings to the team. In retrospect, UBC’s national win isn’t entirely down to the numbers, though. Each year is different: teams change and variations occur outside of what can be added into a spreadsheet. Perhaps most importantly, the numbers don’t reflect the overall attitude of the team itself. “I think that, you know, sports science played a role in our success. But at the end of the day, I think the individuals ... the athletes won the championship, and the culture within the group and the quality of the humans that we get to work with within the program [are] really what excite me more so than the spreadsheets,” MacDonald said. For Regehr, that is perhaps the biggest takeaway from all of the data: the reassurance for their community around the attitude the team exudes. In the end, it’s still an ever-changing game.